I plan to be outside Parliament initially 11, 12 and 13 February. I’m happy for anyone to join me and potentially to extend the protest. It will be daytime only, no camping. I have sought permission from relevant Blackfellas and Whitefellas. I will endeavour to engage the media. Others are welcome to publicise. Satellite protests around the country would be welcome. Perhaps a web page will emerge where pledges can be publicly displayed. Candidates in upcoming elections are especially to be encouraged to pledge. Perhaps some of the current Independents would actually be willing and able to pledge. There will be other and larger protests on the 12th, the day Parliament actually resumes. The People’s Embassy can happily coexist with such protests. Parliament is corrupt. It is dominated by money. 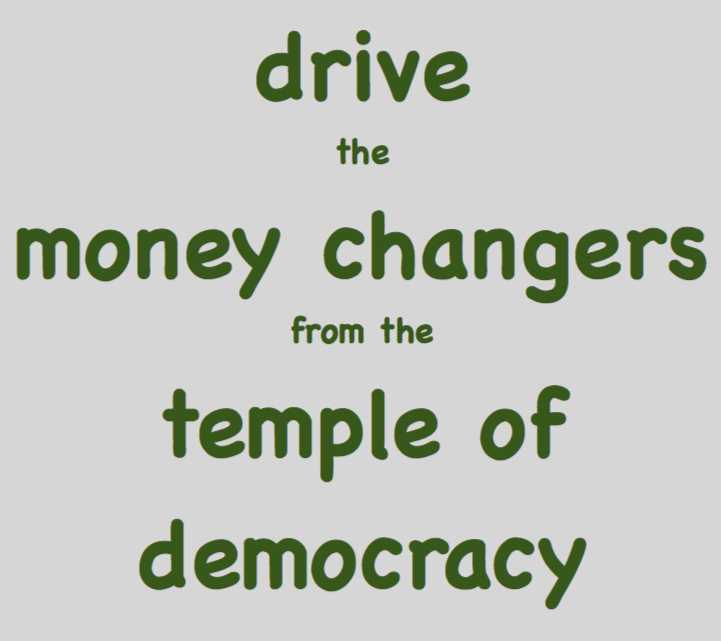 We need to drive the money changers from the temple of our democracy. Parliament is petty, nasty and focussed on fighting for power. We need a parliament that is respectful, constructive and focussed on creating a civil and durable society. Our First People set up their Aboriginal Tent Embassy facing Old Parliament House because they were sick of being ignored. Let us, all the people, follow their example and set up a People’s Embassy, facing New Parliament House, because we are sick of being ignored. As a first step, we can expose them. We can ask them to sign pledges – to serve the people, to be respectful, to document in real time the people they meet and the money they take. Any unwillingness to sign up would be telling. It would encourage our fellow citizens to look for candidates who would actually represent people, not money. No one would have to administer these pledges, it would be up to candidates to tell us what they are willing to undertake. Then we can be the judges. Other pledges might be considered, perhaps acknowledgements of the value of community and the living world. This is not about policies, though we certainly need wiser policies. Rather it is to restore our ailing democracy to health. We can seek permission of local custodians to be on their land. The People’s Embassy will be open initially from Monday 11th February 2019, for three days (a table and signs, daytime only, no camping). Parliament resumes on the 12th. There will also be a Stop Adani demo at 9am on 12th I understand. Anyone is welcome to come along and support the Embassy. Embassy branches can be opened in other places by anyone who wishes to support the initiative. I pledge to place the interests of all the people above personal and sectional interests. I pledge to treat my fellow parliamentarians with respect and to seek constructive resolutions that serve the people. I will accept donations only from private individuals. I will support moves to provide matching public funds, $___ [$3?] for every $1 privately donated, and to require media to provide specified free exposure for candidates and representatives. These may be less familiar in the political context, but candidates and citizens can consider their value in creating a more civil, constructive and durable society. I value competition and cooperation. I value individuality and community. I believe the purpose of an economy is to support the society we choose to create. I believe we are part of our planet’s dense web of life and that its health is our health. I choose to act out of knowledge, awareness and love, rather than to be driven by fear and misled through ignorance.